I had never been to a Grateful Dead concert. But to do his portrait, I had to answer the question: "Who IS Jerry Garcia?" For that story, click Here. 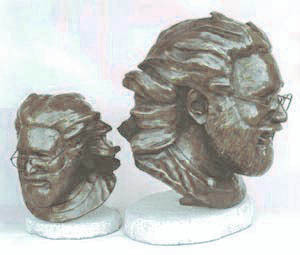 My bronze portrait of Jerry Garcia was included in the National Sculpture Society's New York portraiture exhibition "Making Faces" in 1996. Approved by the estate of Jerry Garcia, the limited edition bronze is available in two sizes, 22 inches (56cm) high, and 14 inches (35cm) high. The smaller one is "coffee-table size" comfortable in any average-size living room. The large version has a much more massive presence, and requires a bigger space, like a large living room/family room or a conference room. Any place where the Grateful Dead's music would be O.K. Both should be placed for viewing at approximately eye level, to get the full effect of his eager-for-life expression. That means the coffee table itself is too low, unless your custom is to sit on the floor (not so unusual among the Deadheads I know). All rights reserved. No part of this site may be reproduced in any form without express written permission of the author.